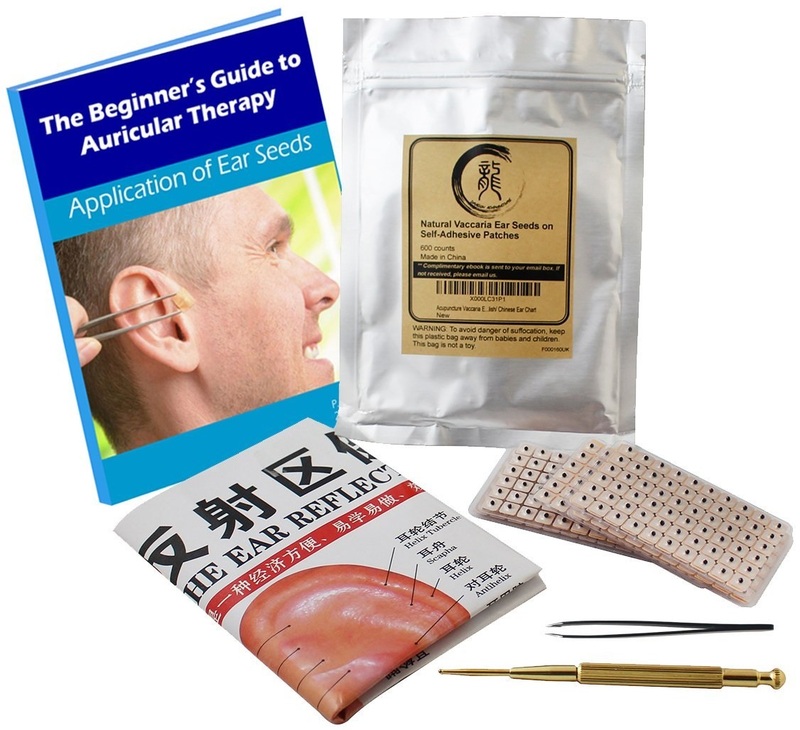 We recommend this Ear Acupressure Starter Kit for beginners. This kit comes with a picture guide that will show you where to place the beads for treatment of different conditions. It also comes with some extra tools for applying the beads. If you don't need the picture guide or the extra tools, then you can save a few dollars by just buying the acupressure ear beads alone on this page. Our favorite acupressure bead set. Click here for details. What Are Auricular Acupressure Beads? Auricular acupressure beads gently stimulate acupuncture points along your ear’s external surface. These charted pressure points track the ear’s ridges and, follow the valleys created by the ridges. Ears are like fingerprints. They vary from person to person. Everyone’s ears, feet and hands are scaled-down replicas of the energetic mechanisms that participate in the management of your body. Neuroscientists, through their endeavors, have found similar mappings on the surface of the brain. The human ear is home to many acupressure spots; interconnected through the body’s meridians to corresponding body parts. The applied pressure stimulates and balances gridlocked life-force energy. Acupressure beads are tenaciously placed to stimulate an exact point on the ear for a very specific purpose. Energetic bottlenecks, such as these, are often the root cause of pain, inflammation and a host of other preventable conditions. Disease begins when your life force energy has been halted by an energetic obstruction. At this point, when life-force energy has been thwarted (and not allowed to flow freely), the body responds by creating disorders like addiction, depression and indigestion, among others. Acupressure beads treat these, and other ailments, by gently stimulating arrested life-force energy on an auricular pressure point. While some patients respond immediately to acupressure therapy, other patients require a few days before they spot a noticeable improvement. The annals of Traditional Chines Medicine (TCM) unfailingly acknowledge that the ear, by itself, is quite helpful when establishing and assessing a patient’s current health condition. Small metal beads are placed on plotted acupressure points along the ear’s exterior. For those who wish to keep their acupressure beads in one place for a few days, it is recommended that they be secured by a small piece of medical tape. A therapy plan - what part of the body will you focus on. Using an acupressure ear chart, locate the pressure point that treats the target condition. Grab the alcohol wipes, the medical tape, a pair of scissors, and a mirror, preferably magnified. Don’t forget the acupressure beads! As you begin to self-treat, direct a quiet, refined intention to the inside of the body to where the target area resides. Then, pause for a moment, remaining silent in your intention. Next, wipe the external part of your ear with an alcohol wipe to properly disinfect the area you intend to place an acupressure bead. Carefully apply the acupressure beads to the auricular acupressure healing points linked to the disorder you intend to treat. Acupressure beads can be applied to just one ear (either side), or, to both ears at once. Acupressure practitioners recommend that the acupressure beads that need to stay in place –for a few days or so, be reinforced with a small slice of medical tape. Check out this video, which verbally and visually explains how to use acupressure beads to effectively treat emotional issues and/or obesity. The auricle, in anatomical circles, is the visible part of the external ear. Auriculotherapy dates back to when the “Yellow Emperor’s Classic of Internal Medicine” set forth the medical Chinese philosophies practiced 2500 years ago. The “Yellow Emperor’s Classic of Internal Medicine” is an all-inclusive anthology of the acupuncture practices applied around 500 BC. Traditional Chinese Medicine (TCM) is based on the fundamental belief that conditions within the body are treatable by stimulating specific points on the outside of the body, including the external portion of the ear. In fact, TCM practitioners are trained to observe the color of one’s ear as the color will change as a result of a persistent energetic unrest and conflict deep within the complex, meridian networks. The appropriate application of acupressure beads momentarily revs up your metabolic rate and decreases your appetite. This is subtly accomplished by manipulating your nervous system in plain sight. Acupressure beads are capable of influencing how quickly glucose can be metabolized. Acupressure beads also rev up serotonin levels, which reduce the body’s intrinsic need to plan ahead by storing abdominal fat. Beating a nicotine addiction is notoriously challenging, but it can be accomplished with a patient committed to the process, and the energetic support generated when acupressure beads are appropriately placed on ‘stop smoking’ acupressure points. To quit smoking, the nicotine-addicted person requires consistent emotional support, in addition to help with the inevitable symptoms of nicotine withdrawal. This dual approach to the emotional and physical energetic elements, act in tandem to reduce nicotine withdrawal symptoms. Chronic pain occurs when your muscle’s surrounding tissue becomes inflamed and as a result of the inflammation, the muscle begins to tighten and stiffen affected muscles. An energetic logjam will likely trigger painful muscles spasms, like a ‘charley horse’ in one’s calf, for example. Auricular therapy effectively reduces chronic pain by stimulating an endorphin release in your body. Endorphins are your feel good hormone. Endorphins, by their very nature, relieve the intensity and severity of a patient’s chronic pain. It is possible, although atypical, that acupressure ear bead therapy activates various side effects - like lethargy, discomfort or even wooziness. These uncommon side effects are likely the result of the acupressure bead’s ability to boost the sensitivity of your nervous system. A heightened nervous system amplifies the ailments (and its symptoms) you seek to treat. However, these scarcely found side effects are temporary. They disappear when your body’s self-healing processes hit the ground running.